Once upon a time, long long ago, my mother used to bake. My sisters and I would go off to school and, upon returning home, we would find a delicious homemade treat for our afternoon snack. We never knew what she would make next. It could be cookies, brownies, a cake covered with frosting and sprinkles, or even a pie. 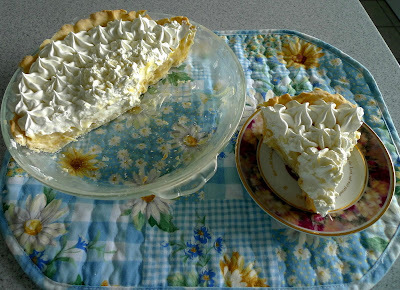 One particular pie she made was a Pineapple Cream Pie and it was my dad's favorite. Over the years, she stopped making it. 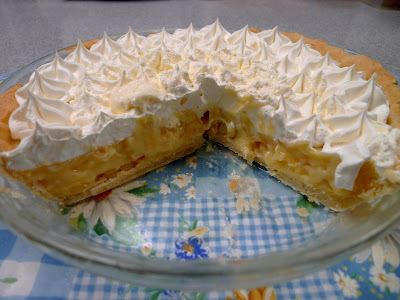 Still, my dad continued to dream about the day when that pie would once again grace our table with its presence. 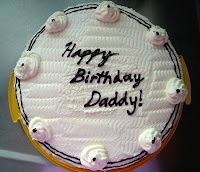 Lucky for him, I inherited the baking gene and decided that I would try my hand at it. 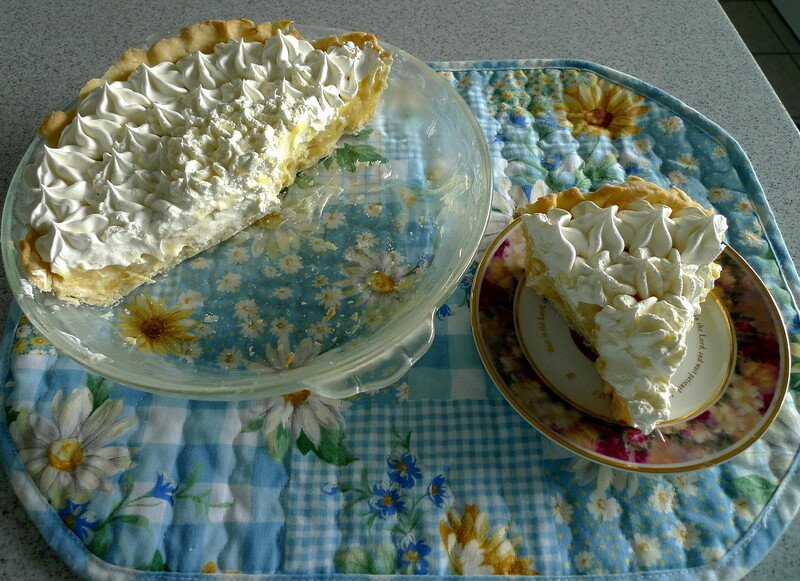 The pie is fairly simple to make. 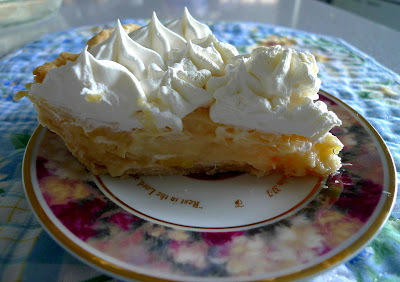 It starts with a thick vanilla pastry cream to which you add crushed pineapple. Then, you pour it into a baked pie shell and chill it before covering it with a mound of whipped cream (or meringue if you choose). When my dad got home from work, his eyes lit up to see such a rare treat. He promptly cut himself a big piece, ate it, then proceeded to cut himself a second piece. That's definitely a compliment to how good it tasted. I sneaked a couple bites too and it was just as I remembered it. Unfortunately, since I don't get to come home too often, it'll be a while before my dad gets to enjoy his favorite pie again. But, at least for now, he can savor this one. Whisk together the milk, sugar, salt, and egg yolks in a large saucepan. Whisk in the cornstarch and flour until no lumps remain. Bring to a boil over medium heat, stirring constantly. The mixture will thicken. Once it begins to boil, keep it on the heat for 1 min. more, stirring all the while. Remove from the heat and stir in the butter and vanilla. 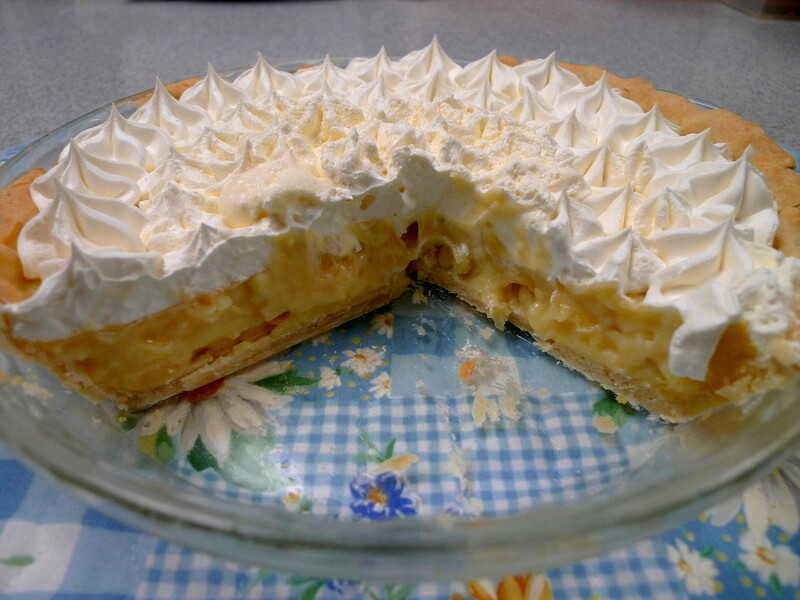 Stir in the crushed pineapple and pour into the baked pie shell. Put in the fridge to chill for several hours. Once it's chilled, top with whipped cream or Cool Whip. 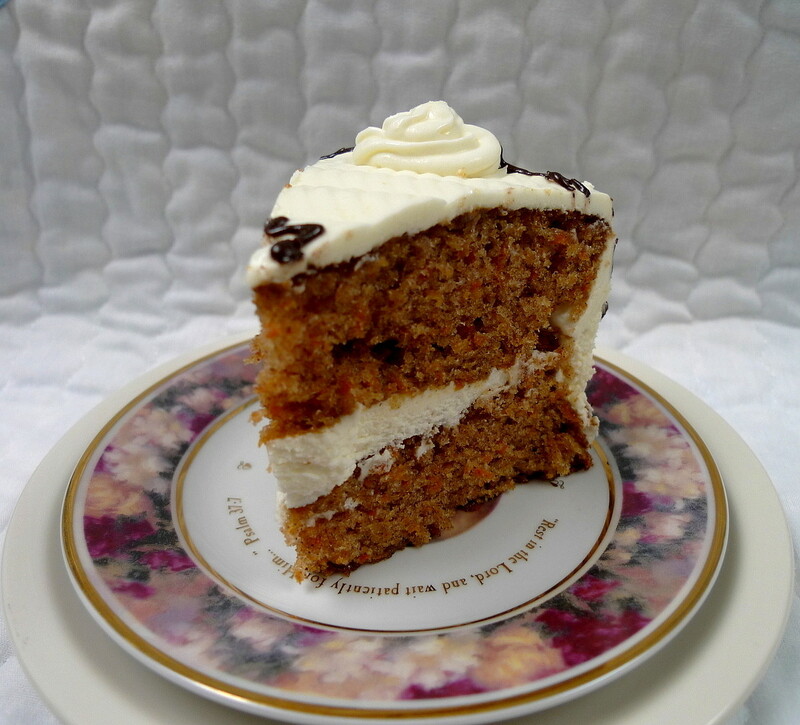 My mom loves red velvet cake, but my dad's favorite is carrot cake. He's loved it ever since he ate it at a wedding nearly 20 years ago and still raves to this day about how moist and flavorful it was. So, when his birthday came around, I knew that only a carrot cake would do. 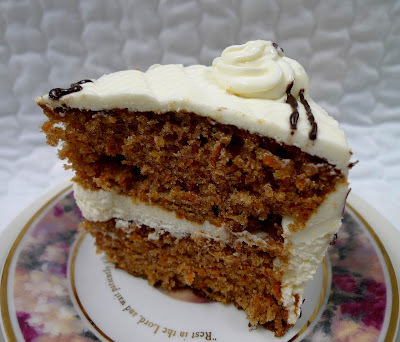 It wasn't possible to replicate that exact carrot cake since I don't have a recipe for it and I never tasted it myself. Still, I trusted that the highly praised Bill's Big Carrot Cake would at least be to his satisfaction. It was with great excitement that I began making this cake as a surprise for him. 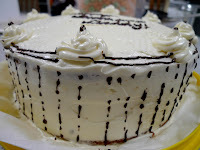 It was also the very first cake that I had ever made from scratch, so I hoped that all would go well. The only changes I made was to leave out the coconut and raisins (we like our carrot cake simple) and the nuts (due to allergies). I also used my own cream cheese frosting recipe. The cake baked up beautifully in the oven and its yummy scent permeated my kitchen. I eagerly took the cakes out, let them cool a little, and prepared to flip them neatly out of their pans. And, that's when trouble struck. Those cakes did not want to come out. I shook them, my sister shook them, we ran knives around the edges over and over again. Finally, with a ker-plop, out they came. But, to my absolute horror, the bottom of each layer was missing, still glued to the pans, even though I had meticulously greased and floured each one prior to pouring in the batter. I was upset, who wouldn't be? But, as my sister reminded me, it's the taste that matters most. A little frosting could easily glue those pieces back on and no one would be the wiser. She was right. 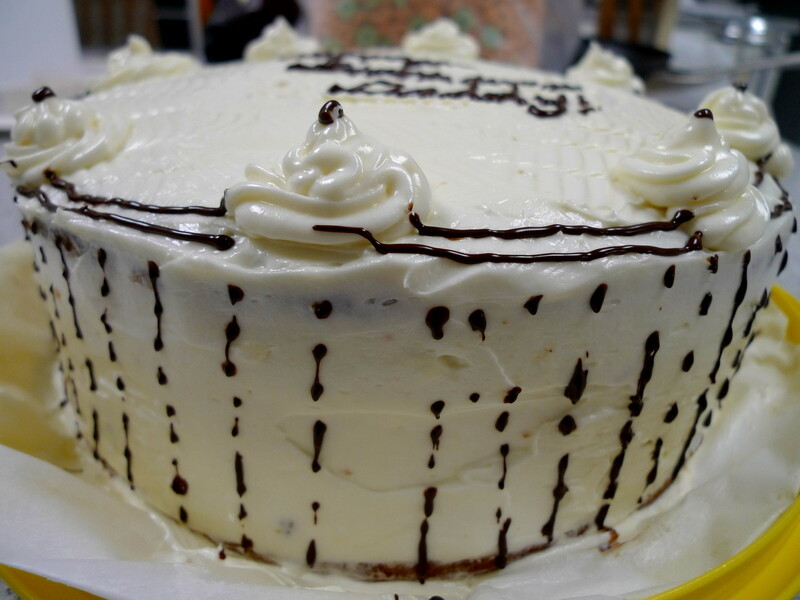 Once those layers were frosted with some cream cheese frosting, the cake looked perfect. My dad was definitely surprised and ate a big piece of it with gusto, enjoying every bite. 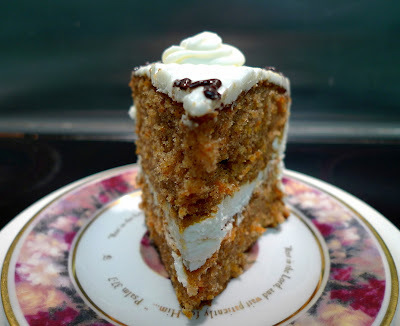 I'm not sure how it stacks up to that carrot cake from the wedding, but it certainly meets my expectations - super moist without being oily, not the least bit heavy, and wonderfully flavorful. You can bet that this cake will make its appearance at many more birthdays in the future. Preheat the oven to 325F. Butter three 9x2 inch round cake pans, flour the insides, and tap out the excess. Put the two pans on one baking sheet and one on another. Whisk the flour, baking powder, baking soda, cinnamon, and salt. 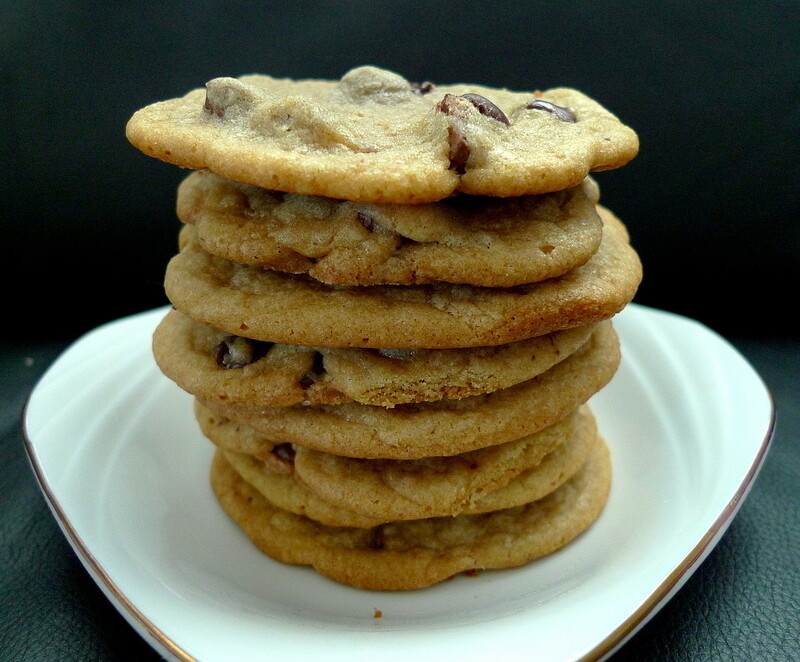 Beat the sugar and oil together with a stand mixer or hand mixer on medium speed until smooth. Add the eggs one by one and continue to beat until the batter is even smoother. Reduce the speed to low and add the flour mixture, mixing only until the dry ingredients disappear. Gently mix in the grated carrots. Divide the batter among the baking pans. Bake for 40-50 min. until a thin knife inserted into the centers comes out clean. The cakes will have just started to come away from the sides of the pans. Transfer the cakes to cooling racks and cool for about 5 min., then run a knife around the sides of the cakes and unmold them. Invert and cool to room temperature right side up. Frost with cream cheese frosting. Beat the cream cheese with the butter until well blended. Beat in the powdered sugar until creamy. I baked my cake in two round cake pans instead of three. It did rise up high above the pan's edges, but didn't spill over. Still, for your peace of mind, if at all possible, use three pans as the recipe states. I'd recommend using parchment paper in the cake pans instead of only greasing and flouring them. Half of my cake bottoms stuck to the pans despite the fact that I greased and floured them well. I can't believe that my chocolate chip cookie quest is finally coming to an end. 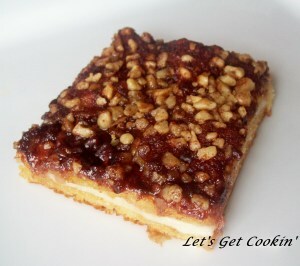 For those of you who don't know, I baked, tested, and posted 13 different recipes for this treat. Who knew one little treat could be so versatile? As for the winner, however, you're going to have to wait until next Monday. The quest was so much fun (and so yummy) that I'm almost tempted to go on a quest to find the best brownie recipe. But, I think I'll shelve that idea for some day in the very distant future (although I admit that I already decided which recipes I would try when I do attempt that quest). Besides, don't brownies usually all come out great anyway, no matter the recipe? It seems that everyone who is anyone has made these cookies and sung their praises so I just knew that my quest would not be complete until I tried them. 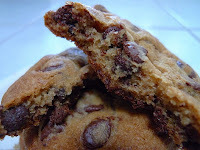 The differences between this recipe and others is that it uses a combination of cake flour and bread flour, requires a 24-36 hour chilling time, and uses chocolate disks instead of ordinary chocolate chips. Well, bread flour I had, but cake flour is not something that I usually keep on hand. So, since others said that all-purpose flour worked just as well, I used that instead. For the chocolate disks, I used the Chocolate Callets from Trader Joe's and those worked fine. The cookies were huge!!! As you can see from the picture, each one was nearly as big as my plate. They did spread out quite a bit in the oven, but I think that was due more to my gas oven than the recipe itself. The resulting cookies were chewy with crisp edges and the chocolate disks melted nicely creating ribbons of chocolate running through the cookies. 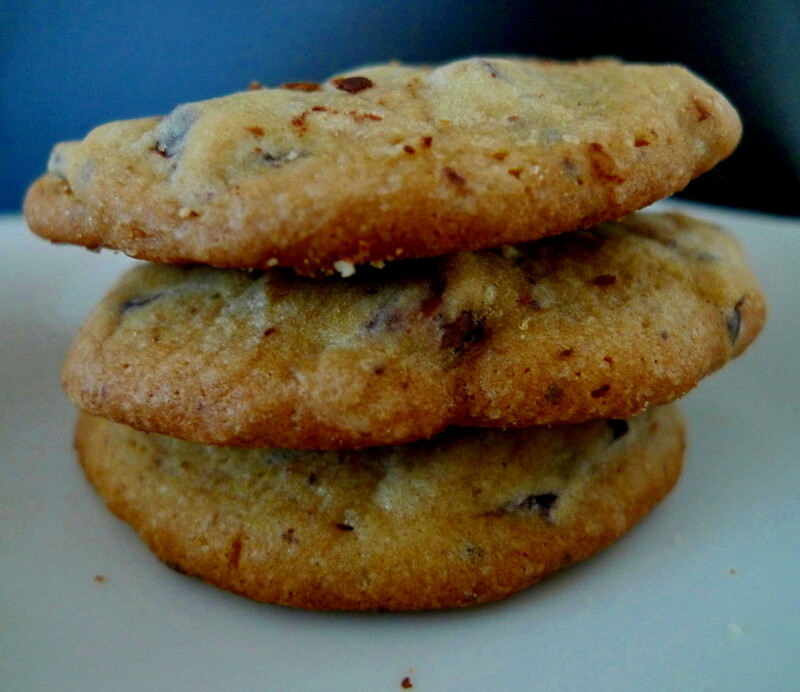 I honestly wish I could give these cookies a rave review. They were tasty, but in comparison with some of the others I've tried, they just weren't as good in terms of caramel flavor. I guess when it comes down to it, I want the chocolate to enhance the flavor of each bite of cookie, but I don't want the chocolate to BE the cookie. My family also found the chewiness to be a bit odd - more bendy chewy than soft and chewy. To be fair, if I had used cake flour, they might have been more tender so that is something to consider. 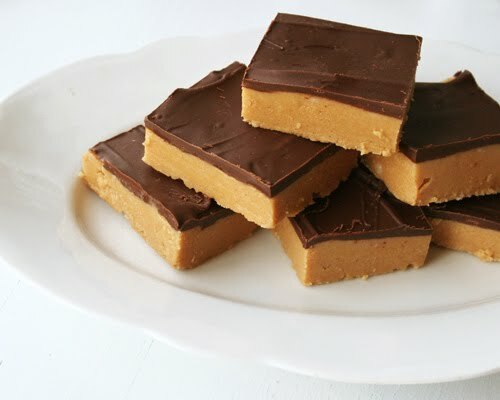 One day, I will make these as the recipe directs. But, for now, I will say that I have other frontrunners in mind. This cookie recipe comes from my Auntie Pearl. She's not really related to me, but growing up in Hawaii, everyone is like one big ohana (one big family). As a result, you end up calling a lot of adults "auntie" and "uncle," especially those who are close family friends. Well, every Christmas, my Auntie Pearl would make us a batch of these chocolate chip cookies and they were always greatly enjoyed. When I grew up, I continued the Christmas tradition and made these cookies to give to my friends. During all that time, I tried a few other chocolate chip cookie recipes, but none of them seemed to be as good as these when it came to taste or texture. 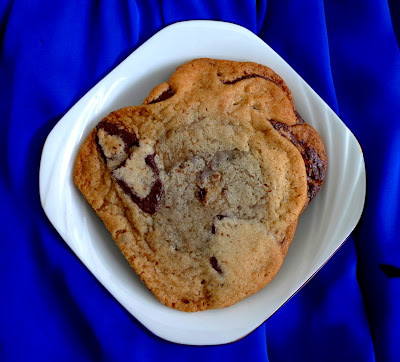 The one thing that I especially like about this cookie is that it holds its shape well and stays thick even while baking, giving it that lovely combination of a dense, chewy middle with crisp edges. And, like I said, it always tasted good to me. So, it was with great anticipation that I baked up a batch, believing all the while that it could still be better than any other. What I found instead was that it is a good cookie, but . 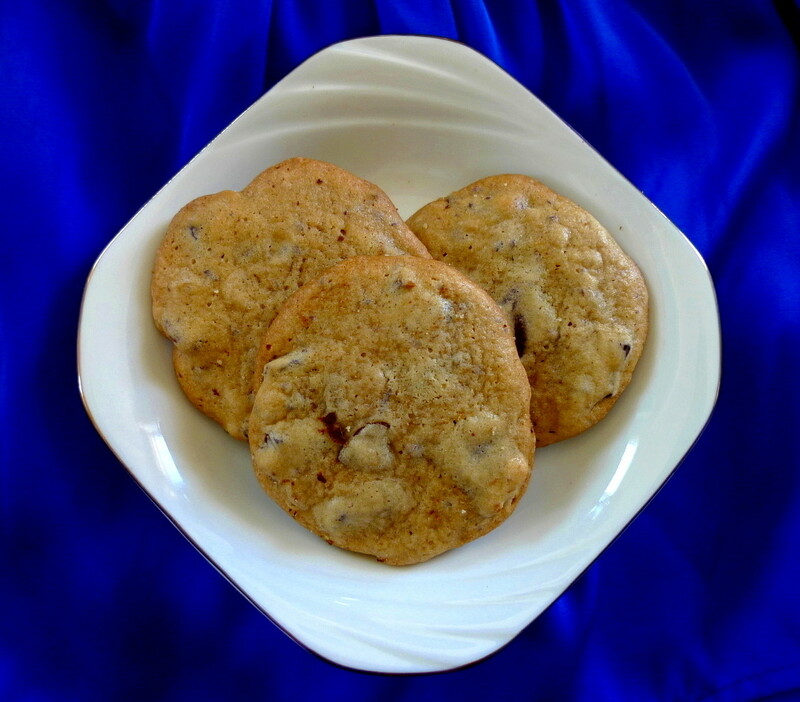 . . after eating so many GREAT chocolate chip cookies on this journey, my family favorite now paled in comparison. I see now that I never knew what GOOD chocolate chip cookies were before I began this quest. It's definitely been an eye-opener. And, while it pains me to say goodbye to my old family stand-by recipe, it is with a wide grin and open arms that I now say hello to the new recipes I've found. Combine the flour, salt, and baking soda, and set aside. Cream butter and sugars. Add vanilla and the egg and mix to combine. Add the dry ingredients and stir to combine. Mix in the chocolate chips. Drop by tablespoonfuls onto a cookie sheet and bake at 350F for 10-15 min. or until cookies turn golden brown and are set in the center. I found out about these cookies while reading Reeni's blog, Cinnamon, Spice, and Everything Nice. 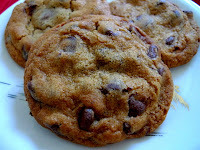 Like her, I realized I didn't have any chocolate chip cookie posts on my blog (well, maybe just one) and that's what started this whole CCC madness. 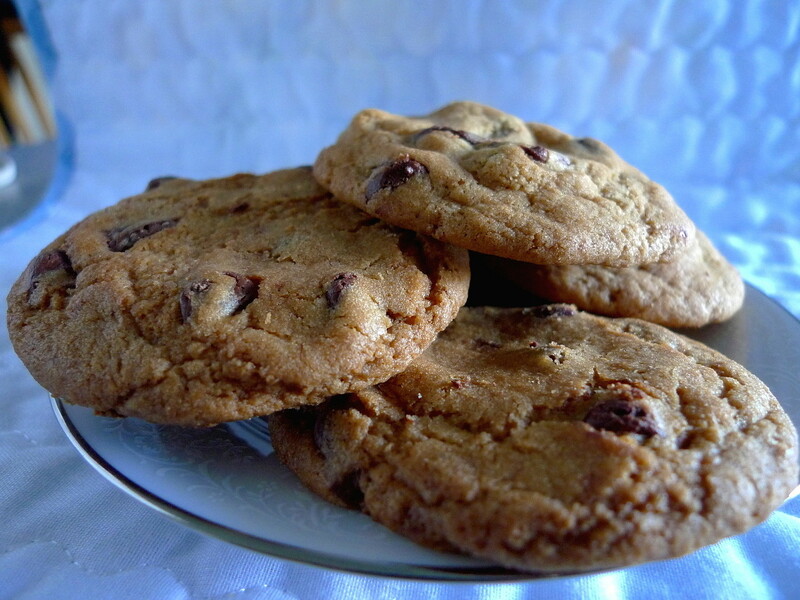 You can bet that there will definitely be chocolate chip cookie posts now. A LOT of them. 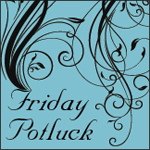 I've always heard that you can't go wrong with King Arthur Flour recipes, so this one also made it onto my list. 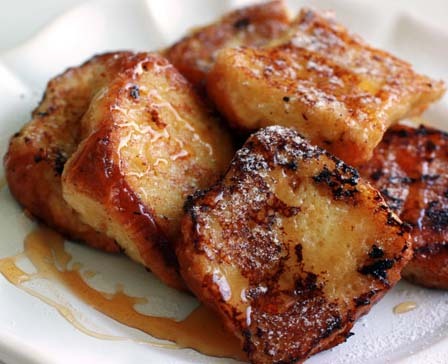 It uses brown sugar and white sugar in equal amounts and it also includes vinegar as one of the ingredients. I've heard of adding hot water to a cookie recipe, but vinegar? I'm sure there's some sort of chemical reaction going on with that. Maybe it works with the baking soda and keeps the cookies from getting flat. I didn't know, but I was going to find out. The only change I made to the recipe was to use all unsalted butter instead of a butter-shortening combo. I also didn't add the optional almond extract. I actually made this recipe twice. The first time, I baked the dough right after making it. 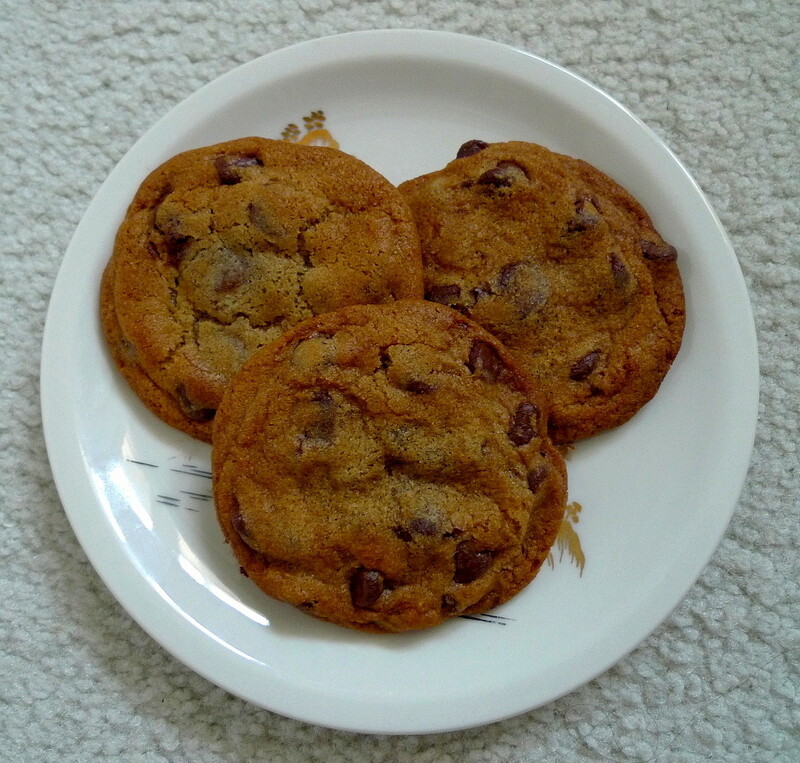 I got wonderfully thick chewy cookies with nice crisp edges and a crunchy outer shell. But, the cookies were pale and lacked flavor. The second time, I chilled the dough for 48 hours as KAF recommends then baked them and voila! 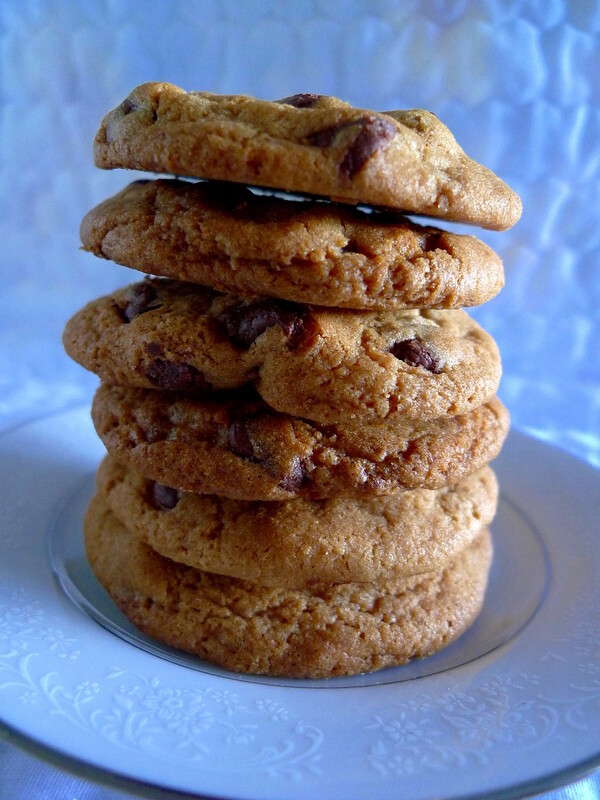 This time, the cookies took on a darker caramel colored look as they baked. 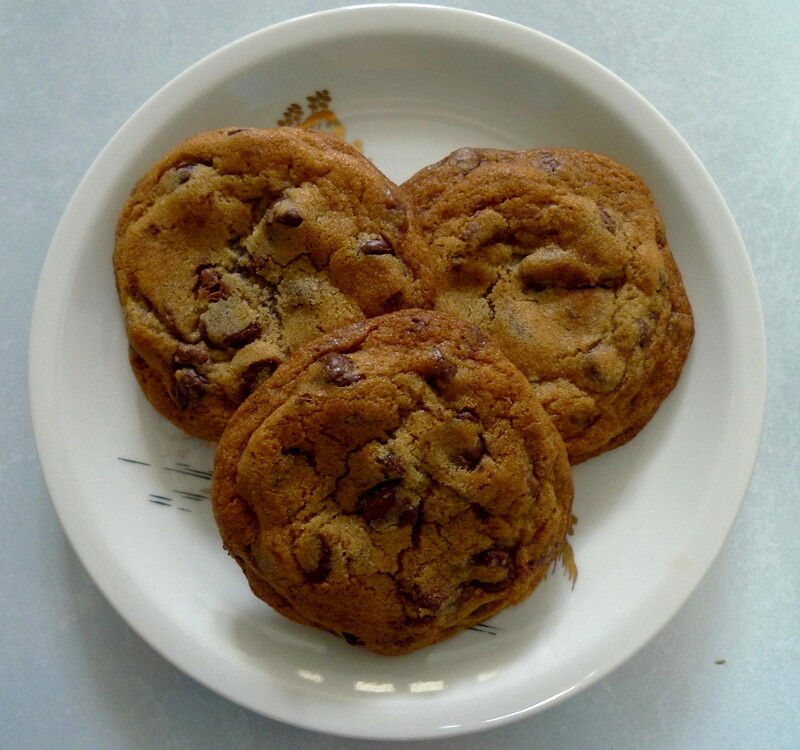 The resulting taste was also completely different from the unchilled cookies. These were so much richer with delicious buttery undertones. I'm not sure how they would have been after only 24 hours, but I can assure you that the 48 hour chilling time is definitely worth the wait. By the way, I also let some dough chill for 72 hours just to see if it would make the cookies even better. What I found was that less is more in this case. 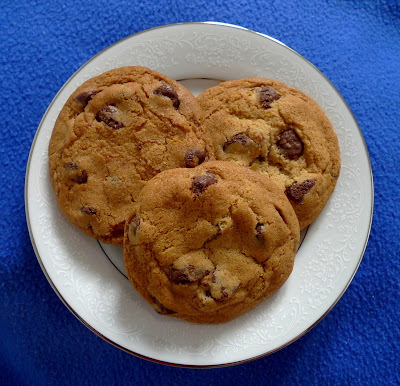 The 72-hour cookies actually lost the potent caramel flavor that was so prominent in the 48-hour cookies. I'm not sure why this happened. All I can tell you is that you will get the best results if you go with a 48-hour chill time, no more and no less. Preheat the oven to 375F. Lightly grease (or line with parchment) two baking sheets. In a large bowl, combine the sugars, butter, salt, vanilla, vinegar, and baking soda, beating until smooth and creamy. Beat in the egg, again beating until smooth. Mix in the flour, then the chips. 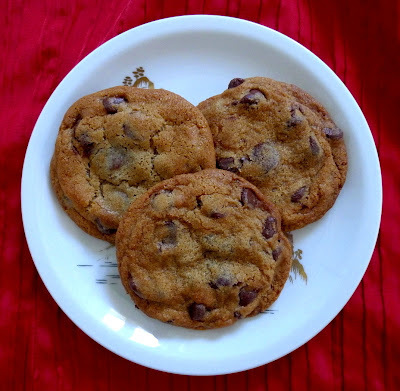 Bake the cookies for 11-12 minutes, till their edges are chestnut brown and their tops are light golden brown, almost blonde. Remove them from the oven, and cool on the pan till they've set enough to move without breaking. Repeat with the remaining dough.